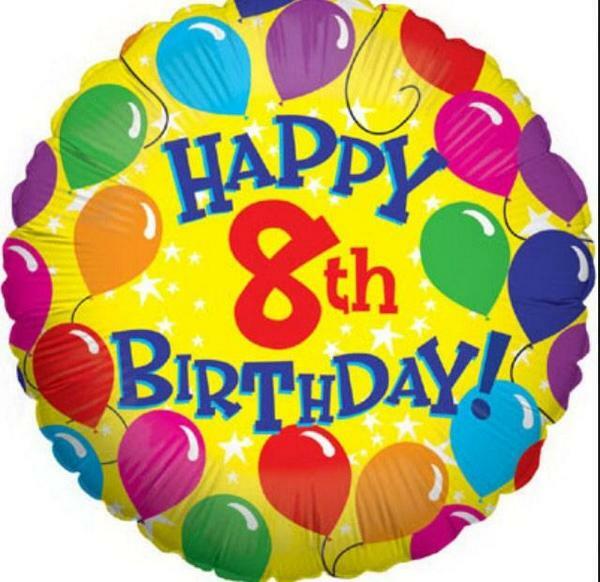 Today marks 8 years since my blogging career began. A year ago I attempted to sum up the first seven years of blogging, but it feels a lot like there is more to report back on from the last year alone than from those 7 years. For a start, the total number of hits on this blog went over a million recently. As the blog used to appear in a couple of other places which wouldn’t be included in the total, the actual millionth hit could have been much earlier but was probably still this year. There were two remarkably popular posts this year. The first, A Christmas Miracle – OFSTED Get It Right For Once, was simply an update on changes in the OFSTED handbook during the Christmas holidays and seemed to be popular mainly because it was the first place people heard the news. But it was also widely suggested that the changes reflected some of the constant campaigning over OFSTED that had been part of this blog for the previous 10 months. The other blogpost, one that still seems to get around 100 hits a day even now, was The Darkest Term: Teacher Stress and Depression which was a series of anonymous accounts of teachers’ experiences of stress and depression. Sobering reading, although I know some of those who contributed are much happier now. Its popularity says a lot about the profession. This is the year that Michael Gove ceased to be education secretary. My comments at the time can be found here. He was a regular reader of this blog, and mentioned it in a number of speeches. Although constantly attacked for not understanding what schools or teaching were like, he had been in charge of his party’s education policy for 7 years and had built up a knowledge of the system, and the debates in education, that no other politician can come close to. He’d also made education one of the most important cabinet posts. It’s a shame to see it sink back into obscurity and for the debate to be once more dominated by those who don’t actually seem to realise what’s at issue. I mean, teacher’s oaths? Really? This is also the year that I went public. As a result of others trying to expose me in an apparent effort to shut me up (how’d that work out for you?) and the fact that I had left my permanent job to go part-time, I decided to end my seven year run of being anonymous and made a number of public appearances. I’ve gone from being absolutely terrified of public speaking in a room of about 30, to really rather enjoying it and daring to appear before one audience that was in the hundreds. I’m particularly fond of discussions as I can get stuck into the debate and don’t have to spend hours preparing. I also like events where there are biscuits. I’ve appeared in print (as opposed to only online) for the first time this year. Firstly, I wrote the foreword to Robert Peal’s Progressively worse: The Burden of Bad Ideas in British Schools . Then, I contributed a chapter to Rachel Jones’s Don’t change the light bulbs: A compendium of expertise from the UK s most switched-on educators (it’s for charity, buy it!). More recently I’ve written for Academies Week, firstly about my hobby of going to education events and secondly, contributing a round up of the best education blogs of the week. I’ve met a number of people who are big in either education or policy for the first time this year, like: Doug Lemov, James O’Shaughnessy and Maurice Glasman (none of whom actually knew who I was at the time), Liz Truss (when still education minister), David Goodhart, Jonathan Simons, Mike Cladingbowl and Sean Harford. I also met television’s Vic Goddard and Oliver from Tough Young Teachers, and came within in a heartbeat of talking to Johnny Ball. I’ve also met and socialised with various education bloggers and tweeters, particularly by organising curries, and I have been doing my bit to try to help good new bloggers find an audience, particularly through The Echo Chamber. And probably the most exciting experiences were my two contributions to Radio 4 programmes. Firstly, I shared my opinions in an episode of The Report about OFSTED and, more surreally, I was interviewed in my front room by Reeta Chakrabarti for One to One. Fortunately the programme makers edited me into some form of coherence. No doubt, once I’ve posted this, I’ll think of some even more exciting blog-related activities from this year and add them in the comments. But it’s been an exciting year to be a blogger and a real change from the early years of blogging which mainly consisted of people telling me I should shut up because only bad teachers think there is anything wrong with the education system or progressive teaching. Here’s to the next 8 years. I realise this has been available in another format for a while, but I have only just found it in a form I can embed on my blog. This is the interview I did with OFSTED’s Mike Cladingbowl and Sean Harford at ResearchED last month. It has been cut so that it misses out the bit where I say I’m going to take questions via Twitter, so it may look like I lost interest and started playing with my phone part way through. Honestly, I’m not playing Candy Crush, I’m just looking for questions. 1) My post about meeting Sean Harford in July, as I think a lot of people missed it because it was in the summer holidays. 2) The latest OFSTED clarification about what they want. Some particularly helpful comments in there about marking and observation that everyone should know. It’s very easy to think that the education world has been transformed. People who used to tell me to shut up because nobody agreed with me, now claim that I should shut up because nobody disagrees. OFSTED are no longer blatantly pushing the progressive bandwagon (although when you look up the consultancies some of their inspectors work for, it is still terrifying). Opinions, that at one point nobody dared to express openly for fear of pariah status, are now mainstream. But there have been a couple of blogs recently that made me wonder. It was not that I disagreed with their contents (you can look here for some things I’ve disagreed with recently) but that the writers didn’t seem to realise that what they were saying was going to be controversial. Perhaps they are unused to the internet, and the idea that if you say publicly something people disagree with you will, at the very least, be asked questions. Or perhaps they didn’t realise that many, many people would strongly disagree. But they were all views that made me think: “Did the writer realise that people would disagree strongly with this?”. One was “Using Lego StoryStarter to Engage A-Level students with the Hitler Myth” in which a teacher described the great success of getting sixth formers to analyse Hitler’s public persona with the German people by use of Lego. I don’t know if the writer missed the controversy over teaching about the Nazis through the medium of Mr Men, but if they did, they clearly didn’t let it affect their choices. The two biggest objections raised then still apply. Firstly, it is infantalising, even more so in this case as it is sixth formers doing A-level, which is meant to be a step to university level study. Secondly, it is poor taste. These are events that led to genocide, not a children’s story. It’s also noticeable that the work produced is not obviously of A-level standard (unless A-level history has changed drastically since I took it). While this might be understandable so early in the year, and I’m not attempting to criticise the students for their work, it seems to provide very little justification for the effectiveness of the method used. Yet the writer seems to have missed all this. He did write a response and as far as people who had criticised thc blogpost had seized on typos or were rude, it’s fair enough to object. However, the key objections, that this is not what sixthformers should be doing, was only dealt with by the defence of saying other people agreed it was okay, including colleagues and students. Perhaps it is acceptable in this teacher’s school; perhaps in behaving this way he was only following orders. However, it was his choice to publicise it and declare it a great success and one wonders how many parts of the education still give the impression that work that resembles play, even for sixthformers, is the best sort of learning. The other blogpost, “When swearing in class was a reason to rejoice #restorativepractice” was one that had me fuming rather than bemused. Written by a senior teacher it described how a disciplinary incident was dealt with. A boy has sworn at some girls in a class and upset them. Instead of being punished (some Twitterers tried to deny the absence of punishment, but in a subsequent post the writer makes it clear they object philosophically to punishing chilren), he was made to apologise. The girls did not accept the apology. The boy then became furiously angry, swearing at the blogwriter as well. Still no sanction was issued, but there was a promise to speak to the girls, and as far as I can tell there was an attempt to persuade them to change their attitude. The teacher appears to be entirely motivated by the fact that the boy has been labelled as having “Aspergers” (they don’t say who by) and that other students should make allowances for this. The girls are described as having “closed minds” for wanting the boy to be punished. Standing their ground at first, one eventually caves and accepts the apology. This girl admits she was angry because she had endured similar abuse in the past, and she is put in touch with a colleague who will helps students “manage their emptions”. If Tom had been punished, according to a set of inflexible ‘do this and you’ll get that’ rules, he would not have had the opportunity to practice the skill of apologising and he would already be questioning his ability to succeed within the mainstream. It’s still one of the most shocking posts I have ever read. If I was a parent at that school I would be looking for somewhere safer for my children. It’s probably the first time I’ve read a blogpost and thought, despite everything, “OFSTED should do something about that”. That a senior teacher in a secondary school could behave like this worries me. That they thought they should share it with the world on a blogpost is just stunning, and does leave me, again, wondering how many schools proudly still have a culture that the right to “inclusion” trumps the right to be treated decently by one’s peers? I’m sure that there will be no shortage of people who accuse me of misrepresenting the posts, even though I’ve linked to them and would encourage everyone to read them to see if I’m being honest. I’m sure there are those who will advocate the principle of never criticising what somebody else does or writes about, for fear of being negative*, even though debate would be impossible under such a constraint. However, I did think it was important to get these posts out there. They celebrate dumbing down and lenient discipline of a sort that teachers too often claim is only an invention of the Daily Mail and Tory politicians. Most of all they show that there are fundamental differences of value within teaching, that should make us question the idea that any institution, or any oath, or any curriculum, could ever represent the views of all teachers. *Whenever I disagree with her, Sue Cowley usually claims not to be saying what she appeared to be saying no matter how unlikely this actually is. If she claims that in this case, then please just take this as a general point, rather than one specific to her. I wrote this post about a week ago, and it largely follows on from my attempt to attend a large number of education events in a short period of time, described here. A number of comments I heard about education over that time gave me pause for thought and for similar reasons. The first was during the Battle of Ideas panel discussion that I was involved in. Emma Knights claimed that there wasn’t a debate over the role of knowledge in education, at least not in schools. (With hindsight, the two of us on the panel who did object were also the only two who are currently employed as teachers). The second was in reading this article from Academies Week about Nicky Morgan, in which she adds “the fifth priority” of creating well-rounded youngsters “emphasising character, resilience, grit” to the other priorities of her department. I’m not claiming any of this is exceptional. With regard to the “fifth priority”, in education you can set lists of priorities so long that it would be easier to say what isn’t a priority. You can design a curriculum with dozens of aims. You can give out so many prizes that nobody actually feels rewarded. You can promote almost every teacher in a school without giving them any actual power. When people don’t want to make difficult choices they often find that choosing everything is almost the same as choosing nothing. Like giving a child a 17th final warning, you can create the illusion of making a decision without actually committing yourself to anything. Similarly, when there are apparently stark choices, (including those relating to knowledge) it is easy to claim that they are “false dichotomies”. Don’t know whether small children are in school to play or to learn? Just claim that they learn best through play. Don’t know whether schools are for education or for socialisation? Just claim children are educated best through socialising. Don’t know whether children should be learning academic subjects or concentrating on hobbies? Just claim that everything is academic. Or nothing. It amounts to the same thing. There are some genuine false dichotomies in education. There are options that are too vague to be meaningful (like educating the whole child, or encouraging creativity in maths). There are times when certain choices are hidden in order to make an unpalatable position seem the best option. For instance, anyone who wants to let kids get away with bad behaviour is likely to claim the only alternative is a philosophy of “behaviourism”. Or those who want it to be okay for kids to learn nothing, will claim that the alternative is a system driven only by exams. But in cases where we have a choice of what to teach, or what to spend resources on, the choices are unlikely to be false dichotomies. People will have to choose what money is spent on and what is taught in lessons. All of the examples that I started with, seem to come down to an evasion of difficult choices. And perhaps this is why bureaucracy thrives in English education. For a system to function effectively people do have to decide what they are aiming for. They have to decide what gets priority. They have to commit themselves to their decisions. I am always been sceptical when people claim the NHS faces infinite demand that means resources have to be rationed. But in education, there is always more we can do. We cannot do everything. We cannot prioritise every child and teach every desirable personal quality. Sugar paper, post-it notes and brain-storming might generate lists but they don’t generate decisions. In the system we have, people become unpopular not by making the wrong choices, but by making any choices at all. In systems where nobody chooses what it is that must be done first, nothing gets done, and afterwards people try to find somebody to blame for not doing it. It is important not to pretend there is no debate to be had. There is debate over everything and there needs to be. There are people we should argue with. There are educational consultancies where scepticism about educational ideas gets you fired. These are real debates, and while I don’t doubt there are those will try to dodge them, telling me that nobody meant what they appeared to be arguing, or that none of the apparent conflicts are actually real. But I cannot accept this. The differences in opinion are real and important. So please: make a decision; choose a side; express an opinion. It’s the only way anything gets done. For this reason, the teaching profession does not have a shared set of values. Just a series of disputes. This is why some of the arguments have been so intense, and why the attempts to enforce the latter position, about ten years ago, created a culture of fear for those of us holding the former position. Tristram Hunt’s latest failure to understand how education works (it can be found here) is to suggest that an oath can be written to commit teachers to “the values of their profession”. To pick one set of values and make teachers swear loyalty to them, is not to improve teacher professionalism, but to brainwash the profession into thinking that we must be on one side of the debate. What he hasn’t asked is “whose values?” But then we know, ever since he made it to the front bench, he has gradually adopted the values of the progressive camp. He has moved to opposing attempts to increase rigour, and, instead, has been proposing to replace academic learning with the teaching of “character”. The last thing we want is an attempt to force us all to commit to those values. If progressive types wouldn’t commit to my oath below, why should I have to commit to their values? I gave a talk in March at Pedagoo London (my first public appearance) and again the weekend before last at the La Salle Education maths conference on fluency in mathematics. This post is based on those talks and so, inevitably it has taken several posts and revisits some old ground. Parts 1 and 2 are here and here. Finally we come to my advice for teaching for fluency. Firstly, something I started doing this year, is starting all learning objectives with “know” or “practise”. I find this covers everything that’s worth teaching and establishes what you are trying to achieve. But the big challenge is over resources. Here are my recommendations. 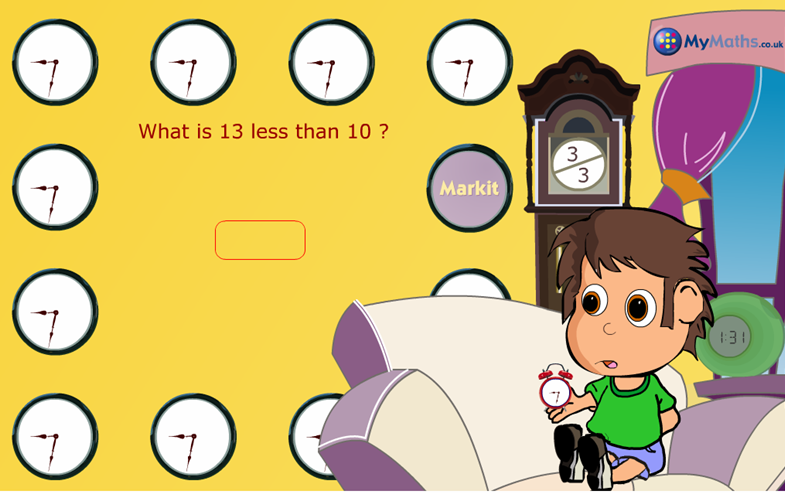 1) math-drills.com This is an American website (note the lack of an “s” in “math”). 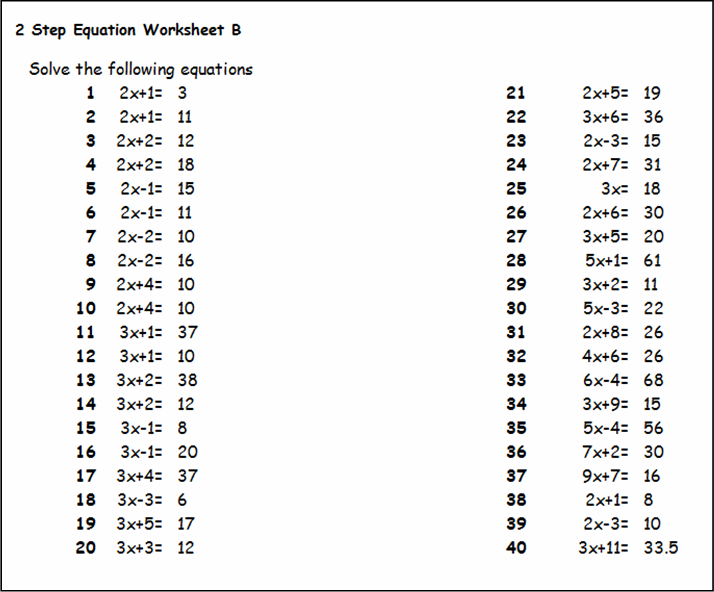 However, it has a wide range of free worksheets that emphasise practice. It’s particularly good for number bonds and times tables. 2) Ten Ticks. Probably already known to every maths teacher reading and very common in schools. But there is often a sniffy attitude that Ten Ticks sheets have too many questions on. I beg to differ. If you are using them sensibly (don’t just read off the levels) then they provide the right amount of practice, and usually the right level of increasing difficulty. 3) Mymaths. Again I’m recommending something that is already widespread. However, what I want to point out, to those who already have access, are the many “Beat the Clock” activities. These are absolutely ideal for developing fluency. 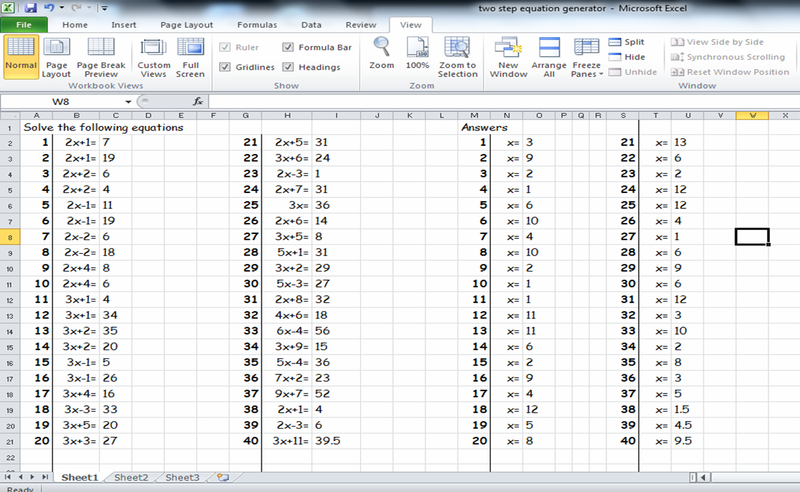 4) Make your own worksheets on Excel. If you need students to repeat very similar work then you can create worksheets in Excel which can then be significantly altered by changing only a few cells. So, for instance, by making the answers random numbers it is possible to generate similar but different equation questions repeatedly. 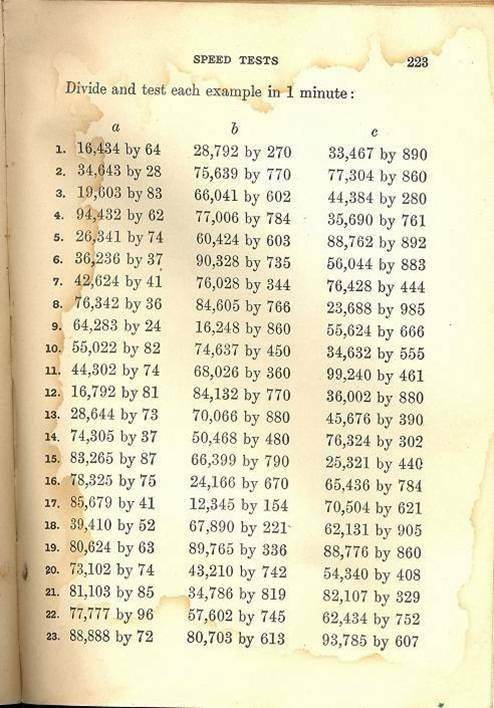 An Excel Spreadsheet. 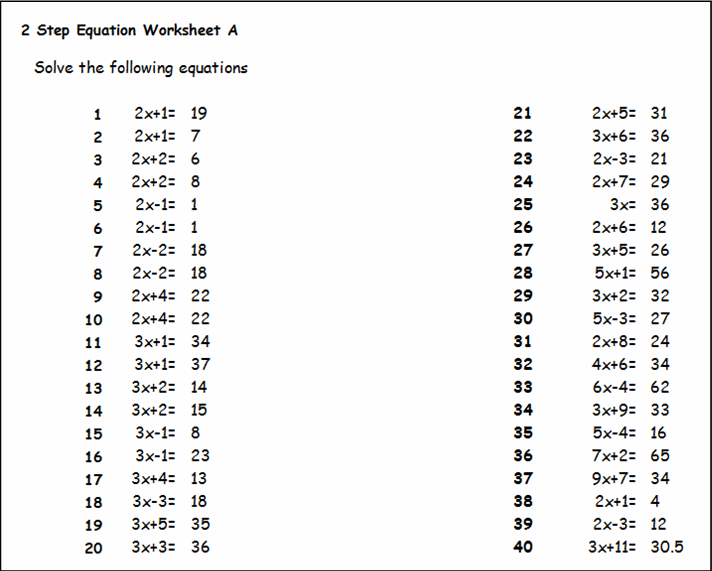 The answers are randomly generated and can be easily changed to generate different versions of the same worksheet (below). 5) Old Textbooks. The fashion for letting students look things up themselves and the hostility to practice has seen textbooks expand their explanatory material and decrease the number of questions. Most of the high achieving maths departments I’ve worked in, or visited, have had textbooks from ten or more years earlier. 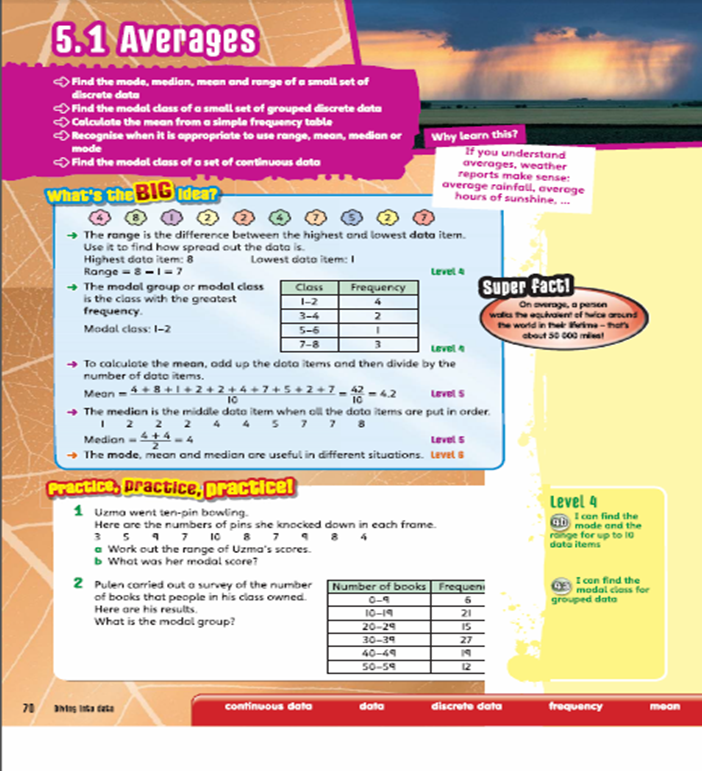 A page from a textbook published in 2008. Those 2 questions are the only ones covering those topics. The most important principle is not having to hide that you are doing any of these things. Teachers should be allowed to get kids to practise. If you have any other resources that are good for developing fluency, please suggest them in the comments. Two things that came up in the questions after the talks are Times Table Rock Stars and mental mathematics practice. The latter is one I use a lot, particularly where it is possible for students to hold up answers. 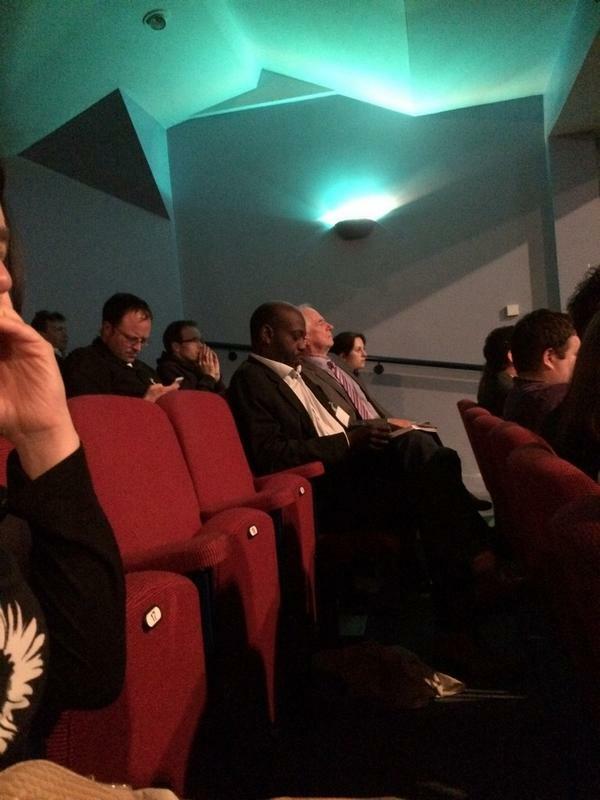 Okay, this isn’t me giving my talk at the maths conference, but if you look closely, it is me sat behind Johnny Ball. Really. You are currently browsing the Scenes From The Battleground blog archives for October, 2014.